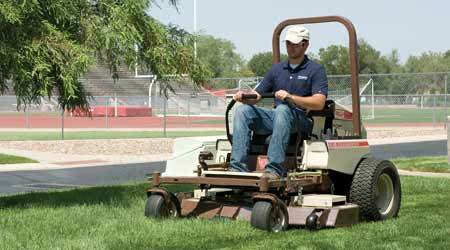 Managers calculating a mower’s total cost of ownership need to consider costs related to planned length of ownership, warranties, insurance, and maintenance plans. The Professional Grounds Management Society’s (PGMS) Landscape Management and Operations Accreditation Program (LMOA) evaluates organizations’ grounds management practices. This column highlights colleges and universities that have obtained accreditation and share information on areas where they excelled in meeting grounds management best practices. Georgia Tech Institute presented activities, actions and projects related to its landscape services and vehicle management unit to demonstrate compliance with LMOA best practices. Develop natural resource management plans. Georgia Tech presented several natural resource management plans, including a landscape master plan, a stormwater master plan, and a campus tree care plan. Design and install irrigation zones and water-conserving devices. Georgia Tech gave a thorough presentation on the use and benefits of a centralized irrigation system and the incorporation of cisterns, pumps, wells and rain gardens. Reduce landfill costs. The institute provided good empirical data and documentation on waste diversion and recycling and reuse of wood chips, grass clippings and leaves. Identify and meet regularly with stakeholders to inform and educate. The institute discussed the function of stakeholder engagement groups, including the landscape review committee, landscape work group, campus tree advisory committee, events logistics committee, and staff council. Georgia Tech presented its best practices to a PGMS evaluation team, which granted Georgia Tech a four-star accreditation rating — its highest — that recognizes a mastery of grounds management practices and the presence of a continuous improvement philosophy. For more information, visit PGMS.org.